Nutty Xian congresscreatures speaking on behalf of Jeezus. Gotta love it. 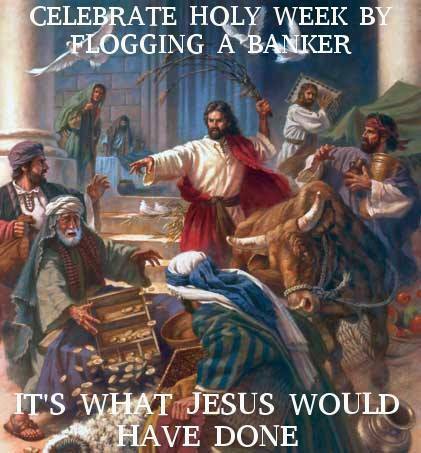 This is a year when Easter and Passover converge more or less. So it’s probably as good a time as any for this post. Full Disclaimer–four days out of seven I consider myself Christian on some level. I was fully invested in the faith last decade until my congregation blew up, and a good sermon can probably pull me back in. I’m not here to debate miracles or historical anomalies, and I assure you I’m not out to convert anyone. And I struggle with cobbling together my disparate views on things and trying to keep cognitive dissonance down to a dull roar. I’m at the point I’d have to have my own denomination (The First Church of ME) to cover all the bases. Anti-war, anti-violence, anti-death penalty regardless of the nature of the crime, but also pro-choice (probably in the ‘seamless garment’ theology area). Perhaps my ideology is edging close to socialism or even Marxism (though I’d point out those verses 4:34-35 in ACTS OF THE APOSTLES describing ideal early Xian community–doesn’t 4:35 come awfully close to the Karl Marx description of social utopia: “From each according to his ability, to each according to his needs”? And (also in Acts), God gets kinda frisky with those who don’t share everything. By smiting them dead). 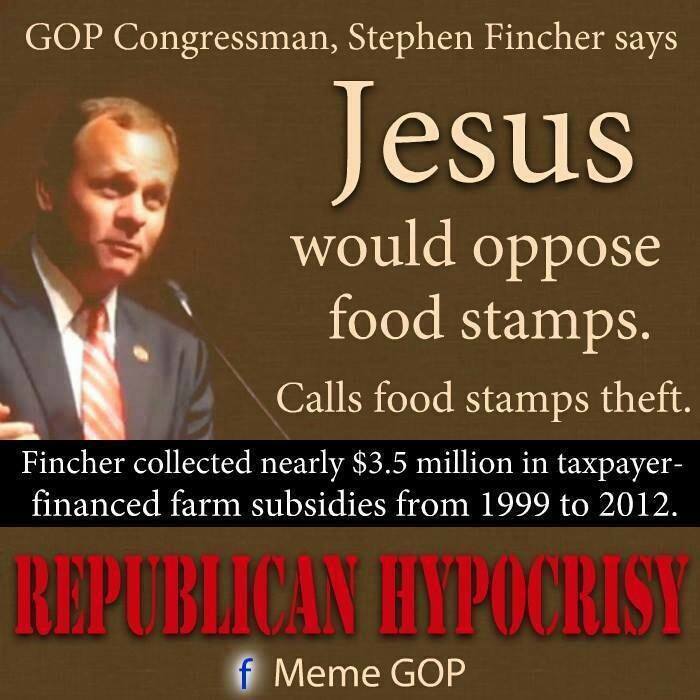 So I’m puzzled by these sorts of quotes outlined in the meme above and the fact that practicing Christians let people like Congresscreature Fincher get away with speaking on behalf Jesus and all that. Political Xians get all huffy whenever something happens in Islam, demanding that all Muslims denounce whatever terror action has been undertaken (even when it’s clear the terrorists are using the faith as a cudgel and don’t understand the basic tenets). But when the killer is a Christian, leaders of the faith aren’t commanded to denounce the individual. There’s nothing I can see in the shaming theology of the Westboro Baptist crowd that survives a close reading of the Gospels. But where are the calls of denunciation? Plenty of secular people have made their disgust clear. But surely there’s some Baptist denominations that find Westboro’s theatrics disturbing–where are their protests against the Phelps crew for kidnapping the faith? People of the cloth do understand that there’s more than a little push-back over the granting of non-profit status to churches and religious institutions in general, right? This doesn’t help. And not to treat the Catholic church as a punching bag, but their continued travails in the ongoing scandals around pedophilia aren’t helping, either Readers of these pages know that I’ve followed the Plowshares movement (almost exclusively Christian and largely Catholic) and I have spoken well of Pax Christi and the Catholic Worker movement. But that part of the Catholic Church may be going away. Father John Dear, a Jesuit priest who’s done prison time for his Plowshares actions and other civil disobedience, was forced out of the Jesuit order (and the priesthood) for not embracing the new edict of the order to get out of the activism business. Dear wrote about his dismissal and the ‘new’ Jesuits… the Society of Jesus has renounced Fr. Pedro Arrupe’s groundbreaking vision of justice and the documents of the 31st and 32nd General Congregations, which call for a radical commitment to justice. It no longer advocates for justice or works for justice… The Maryland Province has closed all its projects that serve the poor. 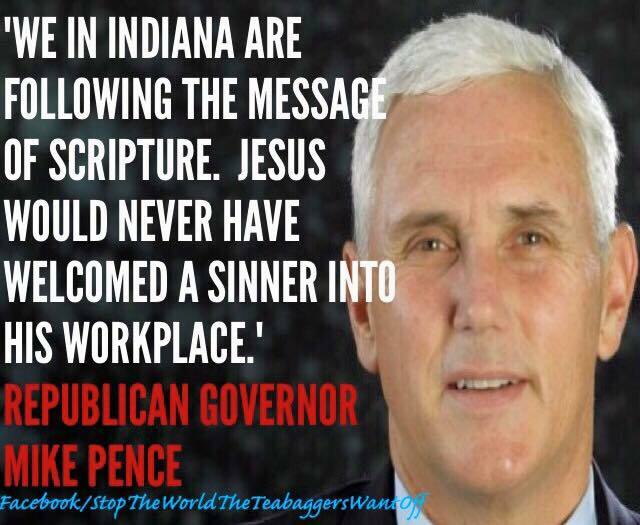 Mike Pence of Indiana pretends to speak on behalf of Xians everywhere. WTF? Didn’t the founder of the Xian faith Mike Pence claims to be following hang out with the least desirable of his time in order to identify with them? The Christians I look up to are the people who do the basic work of the church by feeding people and working against war and militarism. Now here’s a way to spend the week…. Sorry for this rambling post. As I stated at the start, I’m a person of faith about four days out of the week. But even my quasi-agnostic heart is moved this time of year. And I apologize for those people who don’t seem to understand a faith built around a homeless Jewish man. So I leave you with two statements of faith that I keep close. Philip Berrigan: “God gave us the homeless so we could see ourselves as we are, and He gave us the Prophets so we could see ourselves as we might truly be. And that is why we hide the homeless and kill the prophets”. and this, courtesy of Woody Guthrie by way of Merle Haggard. ← DO SOMETHING ABOUT THE FARKING WEATHER! !